In order to address the structural problem of marginalized nationalities and ethnic groups encountered in Ethiopia’s political system, TPLF adopted a policy of institutionalizing ethnicity with federalism. Since 1995 the country has been governed by a newly published constitution, which divides the state in to nine regional states and creation of federally administered two city states. Consequently, there are doubts about TPLF leader’s intention to implement the constitutional provisions in full. The constitution stipulates a fair representation of all nationalities despite its absence in reality. Nationalities and People region feel excluded from state power. As Doctor Merera said, “the EPRDF leaders, keen on the consolidation of their hard-won victory, made sure to selectively invite weak parties most of which were created overnight, and selectively excluded the actual or potential real power contenders from the process.” Yet given the privileged position to top officials, the constitution’s power is more theoretical than real. Accordingly rights of those individuals or groups whom they seek for liberally structured governmental system have been breached. They demand for liberal-democratic system, in which the government should rest on the consent of the governed, and the minority accepts the rights of the majority (i.e. incumbents) to make decisions. Despite, under the law of Antiterrorism Proclamation of 2009, political opponents, journalists, human-right activists and other civil-society representatives had been imprisoned and some condemned to death in absentia. From 1995 to present, despite the mushrooming of political parties in the country, the freedom of opposition parties to operate had been so circumscribed that none of them even had the slightest chance of competing with the EPRDFs. So that opposition political parties considered the government illegitimate and established ethnic-based rebel fronts in the neighboring countries and waged guerilla warfare against the authoritarian government. In 2014 report of Freedom House regarding political and civil liberties Ethiopia received 6 out of 7 points, which is the worst score. Such intentionally mesmerized acts plots down that Ethiopia is one party dominated state. Accordingly rights of those individuals or groups whom they seek for liberally structured governmental system have been breached. They demand for liberal-democratic system, in which the government should rest on the consent of the governed, and the minority accepts the rights of the majority (i.e. incumbents) to make decisions. Despite, the theoretical approval of Antiterrorism Proclamation in 2009, political opponents, journalists, human-right activists and other civil-society representatives had been imprisoned and some condemned to death in absentia. Government clamped down on the number of non-governmental organizations. After the proclamation of charities and societies of 2009 within four years the number of non-governmental organizations lowered by approximately 48%. State’s systematic censorship invades the freedom of speech. Only anti-opposition political party’s biased defamatory reports are delivered on the national outlets. Private news media are nascent. And the media outlets controlled by state have limited reach across the country. According to the Welfare Monitoring Survey in 2011, just 38% of households owned a radio, 10% a television, and 25% a mobile phone (Central Statistical Agency, 2011). This data shows Ethiopia is lagged behind in the sectors of communication infrastructure. Freedom of association and of assembly is still very limited, though that it is excerpted in the national law. Marches, demonstrations and public gatherings are strictly under scrutiny. Such makes it difficult to demonstrate against the government or its interest. For example, it is nearly impossible to demonstrate against government’s decision of sending troops to Somalia, Sudan and South Sudan. On 14th December, 2016 one of senior officials of US Mr. Tom Malinweski arrived in Ethiopia, to make a brief discussion on addressing civic and political rights with the Ethiopian government. He expressed a grave concern about the human rights situation in Ethiopia. In general, Ethiopians are particularly interested in democracy and not satisfied with authoritarian political system in place. The political system is not perceived to be legitimate and there is a wide range of dissatisfaction or serious challenge to it. This is evidence by the fact that the 2014 and 2016 popular Ethiopian’s protest against the government. There is a conspiracy of silence to cover up the crimes against humanity committed against the Ethiopian people. “Haile Salassie was bad, Derg did the resettlement which was also not good, but it was never like this. They never forced us to leave. See this big forest behind us, during the massacre people hid there. Now it will be gone. What is the future for our kids? They will be slaves. The worst part is the people did not come here to talk to us. If they did we could have told them this is our ancestral land” A villager in one of the leased areas in the region Gambella speech to the Oakland Institute. To mention one pillar root cause of the dissatisfaction is the policy of land grabbing adopted by the government which forced farmers to lease their land. The phenomenon of large scale land acquisition has increased in the past years. Between the year 2004 and 2008, 1.19 million hectares of agricultural land has been leased to foreign and domestic investors in Ethiopia. There is an expansion of large scale land acquisition in Ethiopia. The case is government’s policy towards foreign investors is very generous. There is no any limitation in the amount of land to be leased to international investors. Foreign investors have the right to fully repatriate, in convertible currency, profits and dividends, principal and interest payments on external loans, proceeds from technology transfers, and from asset sales in the event of liquidation of the investment, and proceeds from the transfer of shares or ownership to a domestic investor. Expatriates employed in an enterprise may remit in foreign currency salaries and other payments accruing from their employment. Not only this, National Bank of Ethiopia devalued the currency Birr claiming to reduce imports and boost the foreign exchange reserves which caused a severe inflation in the country’s economy. Consumer prices in Ethiopia increased 10.4% year on year in August of 2017, following a 9.4 percent increase in July. It indicates the unjustness of land grab that obviously resulted to shallowness of food insecurity in the host country. An almost total lack of foreign exchange currency, high rates of inflation especially for food and fuel, large scale unemployment, the plummeting value of the Ethiopian Birr, and unserviceable external debt all make for an economy that continues to implode. Mining is also another industry that is gaining ground in corruption. The risk areas undermining the industry, include; licensing, operations and mining revenue, whilst the absence of policy and regulatory framework in land management deterred regional states from implementing the law in the same way. “1. The States Parties to the present Covenant recognize the right of everyone to an adequate standard of living for himself and his family, including adequate food, clothing and housing, and to the continuous improvement of living conditions. The States Parties will take appropriate steps to ensure the realization of this right, recognizing to this effect the essential importance of international co-operation based on free consent. (b) Taking into account the problems of both food-importing and food-exporting countries, to ensure an equitable distribution of world food supplies in relation is in need”. It demands for indigenous peoples to not be forcibly removed from their lands or territories. No relocation shall take place without the free, prior and informed consent of the indigenous peoples concerned and after agreement on just and fair compensation and, where possible, with the option of return. In 2012 UN approves a guideline meant to protect local landowner against land grabbing which states to the increase transparency in land investment which give special strength to the position of local farmers in the land grabbing dealing process. “The right to ownership of rural and urban land, as well as of all natural resources, is exclusively vested in the State and in the peoples of Ethiopia. Land is a common property of the Nations, Nationalities and Peoples of Ethiopia and shall not be subject to sale or to other means of exchange”. In 2005 a renewed rural land administration and land use proclamation NO, 456/2005 claimed rural land belongs to government ownership. More importantly the Sub-Article 5.4 of the proclamation made clear that the rural land redistribution will be assured by leasing right of a rural land. Such policy aggravate for the rise of productivity in Ethiopia. If that is so, why the Anuak massacre in 2003 happened in the Gmabella Region? This policy has served as apolitical advantage to the government since it leads to the greater concentration of authority in the hands of TPLF cadres. Large numbers of Ethiopian people were displaced from their land. Comparing the misery life created by grabbing policy to the pastoralist to the rental fee is ridiculously low. From Bale, Bako, Borena, Rayitu, Wollega, Illubabor, Harage of the Oromo region, Awi of the Amhara region, Metekel, Pawe, Guba and Assossa from Beni Shangul region and from Wollaita and Omo Valley of the Southern region of Ethiopia; a total of 226,500 Hectares of land has been transferred to domestic and foreign investors. Ethiopians demand for all the international norms to be compiled in the process of land acquisition implemented by Ethiopian government. Long-term impact of the unfair land use policy is to achieve the political goal of complete ownership of the land through silent eradication of the indigenous communities. The Anuak, Ogadeni, Oromo, and Omo tribes are the most affected ones. At one time researcher Dessalegn Rahmato conclude in his “Land to investors; large-scale land transfers in Ethiopia” titled thesis, that, the outcome of the landing grabbing policy of the government indicates that the damage done at present by the projects outweighs the benefits gained. In general, Ethiopians are particularly interested in democracy and not satisfied with authoritarian political system in place. The political system is not perceived to be legitimate and there is a wide range of dissatisfaction or serious challenge to it. As of 2009 incident in Madagascar where a 1.3 million hectares land deal with South Korea Company led to the overthrow of the government; such galvanized protest is inevitable in Ethiopia in the nearer future. After twenty six years in power, the EPRDF is in decline. It failed to usher in an orderly transition based on peaceful multiparty competition. The arrest of leading opposition politicians and civil society leaders has immobilized political developments and silenced political speech for the moment and leaves the regime fragile . The government’s priorities are not supportive of an open democracy. So the government has constricted the available political space by imprisoning opposition leaders. Its central policy is regime (TPLF) survival, and by divide and rule tactics and repression, it has survived in power for two decades. But this does not mean that the government succeeds in quelling peoples protest all over Ethiopia. After twenty six years in power, the EPRDF is in decline. It failed to usher in an orderly transition based on peaceful multiparty competition. The arrest of leading opposition politicians and civil society leaders has immobilized political developments and silenced political speech for the moment and leaves the regime fragile. The government has been unable to prevent ongoing armed resistance. Popular opposition appears to have grown due to land grabbing policy. Life of 12-15 million Ethiopian agriculturalists have been affected severely by this policy. After crushing the pro-democracy movement that engulfed the country by killing, arresting and intimidating many opposition leaders and their supporters, the government deliberately narrowed the political space. At present, almost all opposition parties are unable to conduct their activities even if they are legally registered parties. The Federal Ethics and Anti-Corruption Commission (FEACC) is widely perceived as a tool used by the government to silence oppositionists. Semayawi Party (Blue Party), Ginbot 7, The Afar Revolutionary Democratic Unity Front (ARDUF)), Tigray People’s Democratic Movement (TPDM)……are to mention some of the opposition groups that claim for a genuine democracy in the authoritarian country Ethiopia. Throughout the western and eastern part of the Oromia region clashes among the government forces and OLF have been seen daily. To tackle this Ethiopia reached a mutual understanding with neighboring states (Sudan, South Sudan and Somalia) for expelling opposition groups operating in their territories against the regime in their homeland. Especially, the role that particularly Khartoum has played in supporting the various armed groups including the Oromo Liberation Front (OLF) and Ogaden National Liberation Front (ONLF) has throughout been a concern to the Ethiopian government. Not only this other opposition parties, such as OFDM (Oromo Federalist Democratic Movement) and the OPC (Oromo People’s Congress) are accused by the government of secretly collaborating with the outlawed Oromo Liberation Front (OLF). Corruption undermines democracy and good governance. World Bank reported a huge sum of money get circulated illegally among senior officials of Ethiopia. A number of businessmen and state officials were arrested on corruption charges, including the head and deputy head of Ethiopian Revenue and Customs Authority (ERCA). Within Africa, Ethiopia falls into top-10 list in terms of the largest volumes of illicit financial flows (IFFs) specifically in land grabbing operations. According to Transparency Center of international studies report in 2016 Ethiopia is listed as one of the most corrupted nation in the world. Such problem is triggered with the lack of checks and balances to regulate state officials spending. The 26 years of rule by the TPLF regime in Addis Abeba have been marked by extraordinary levels of graft, corruption, cronyism, and outright theft of national wealth. The theft of this national wealth may take many forms, may be more or less brazen, and may be more or less open to scrutiny by outside observers; but the use of the military and security services to protect the regime in continual self-enrichment defines it as a kleptocracy. In other way round in Ethiopia when legal action against alleged corruption is initiated, the motivations are likely political. The government used the anti-corruption campaign as a means to get rid of “disloyal” individuals. Prominent officials from ministerial level to lower officeholders have been held on charge of corruption and racketeering. Best example is the 2014 ouster of Somali regional state president, Abdi Mahmud Omar. This episode was carefully orchestrated, with the state president summoned twice in a week to Addis Ababa by the leaders of the EPRDF, who pushed for him to resign. This was bolstered by criticisms from the national-level chief of staff, General Samora Yunus, due to his ostensible failure to cooperate in resolving ethnic conflicts between Afar and Issa in his region, while the head of the National Intelligence and Security Service (NISS), Getachew Assefa, simultaneously withdrew his support and accused him of corruption. According to Transparency Center of international studies report in 2016 Ethiopia is listed as one of the most corrupt nation in the world. It ranked 108 out of 176 states. As a result of the wide spread embezzlement Ethiopian government has a high level of debt, especially external debt, and counter a difficulty in managing it. Addis Admas Ethiopian gazette states out that the total amount of Ethiopia’s debt reached $23 billion on last July. Ethiopian leaders are genetically more venal, more ruthless and more corrupted. Hayle Gebre an Ethiopian military officer in Somalia who has been repeatedly accused of selling arms to Somali war lords and receiving bribes from Somalia’s presidential candidates is one of them. In a report published by InnerCityPress.com the UNDP’s Director of the Regional Bureau for Africa Tegegnework Gettu has been faced nepotism allegation. Azeb Mesin, former Ethiopian Prime Minister Meles Zenawi’s widow; Salem Kebede, the wife of Mr. Abay Tsehaye; Minister for Finance, Zayed Woldegabriel, Director General of the Ethiopian Roads Authority……the list name of mostly corrupted officials goes on. 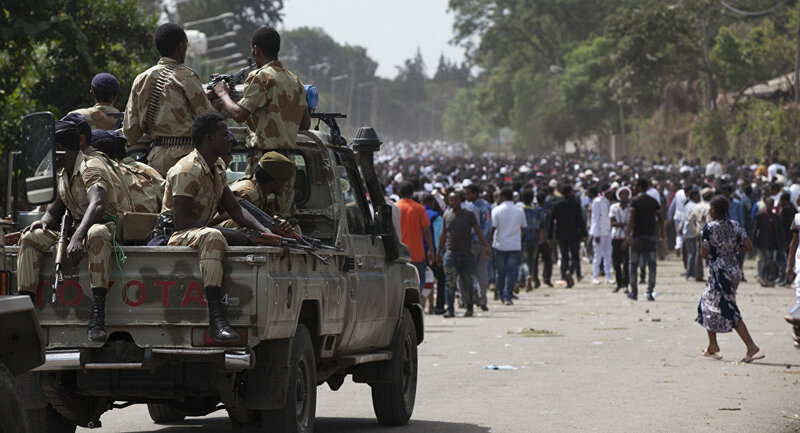 The present crisis in Ethiopia, both internally within its border and externally is as a result of the presence of contesting identities due to differing interpretations of history and opposition groups that challenge the authority of the state. Ethiopia was formed in the late 1880s by means of conquest and agreements with European powers. Heavily populated and strategically situated areas of the Oromo, Afar, and Ogaden region put under control of the Ethiopian empire. From that time those nationalities present themselves as colonial subjects. For instance the region Ogaden constitutes about one-fifth of Ethiopian territory, an area of 80,000 square miles. But those groups irrespective of their minority or majority status, remained excluded from the possibility of participation in major decisions affecting their future. “if one alternative is held up as the only loyal one while other alternatives are suppressed, prohibited or silenced, the debate is not inclusive – and then the elections are meaningless… Under such circumstances it is better to hold no elections at all than to discredit them as a tool for democracy, thereby discrediting democracy in the people’s minds” . As a result the government has been criticized for failing to heed public quest. Opposition leaders portrayed as criminals and terrorist. Thus opposition and dissent came to entail severe punishment and repression. In today’s Ethiopia, people show more allegiance to their ethnic background than their citizenship. It erodes the political power and future viability of the EPRDF’s ethnic based political rivals. It failed to implement democratic norms. It failed on bringing about an equitable development among the regions. Federalism in Ethiopia deliberately ignores democratic rights and good governance. So does the Ethiopian people! 1. Merera Gudina, Ethiopia: Competing Ethnic Nationalisms and the Quest for Democracy, 1960-2000. Addis Ababa: Chamber Printing Press, 2003. 2. Abdalla Hamdok Chege, Michael, Per Nordlund, and Joram Rukambe, Political Parties in East Africa: Diversity in Political Party Systems. International IDEA Research and Dialogue Coordination, 2007.